Also known as the Navigation Pane, this useful feature allows you to see all headings and sub-headings in your document at a glance. It appears on the left as an outline structure. You can click on any heading, and Word will automatically take you to that spot in your document. Also it will highlight the section where the cursor is at the moment, so you don't have to wonder which chapter you're in. Unfortunately Word doesn't do this for you automatically. You have to tell it what your headings and sub-headings are. 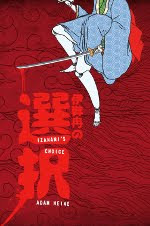 To do that, select a line of text, right-click, and choose "Paragraph...". Then look for a drop-box called Outline Level. In that box, "Body Text" is any text you do NOT want to show up in the Document Map. "Level 1" is for top-level headings, "Level 2" for sub-headings, and so on. I use Level 1 for my chapter titles and Level 2 for each scene (enlarge the picture above to see what that looks like), but you can use it however you want. If you get tired of manually selecting outline levels, you can use Styles. In the toolbar on top, MS Word has a number of styles preset for you -- a list or drop-box with selections like 'Normal', 'Heading 1', 'Heading 2', etc. 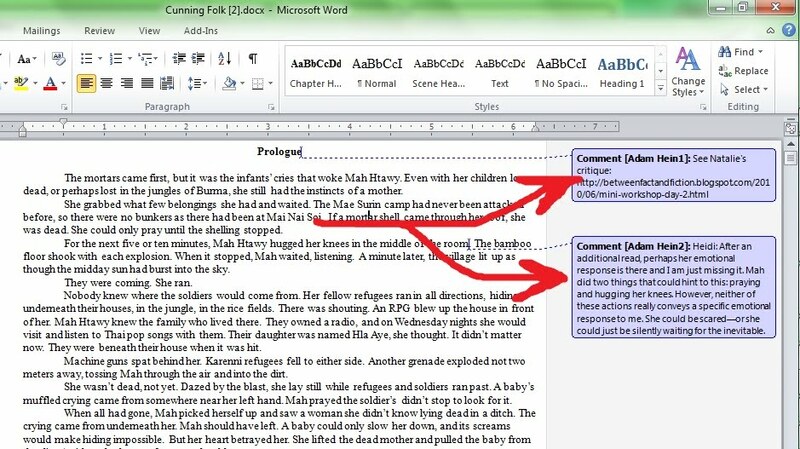 These are a quick and easy way to use consistent formatting throughout your document. You probably won't want to use Word's default styles, but it's not hard to set up you're own. If you use them for the months (or years) it takes to write your novel, it's time well spent. Decide on a font, typeface (bold, italic, etc. ), and an Outline Level, then save it as a new style. (I forget how it works in Office XP, but 2010 lets you select text, right-click, and choose "Save Selection as a New Quick Style..."). This is my favorite feature of MS Word. 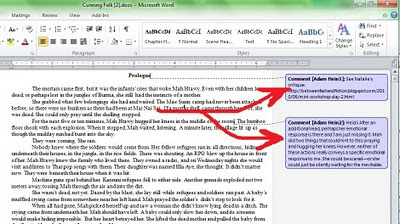 Anywhere in the text, you can hit Ctrl-Alt-M (in Open Office, Ctrl-Alt-N) to add a note or comment in the margin. I love it because it lets you type anything you want without screwing up the formatting or word count of the manuscript AND it's really easy to scroll through without missing a single note. (Open Office actually keeps track of Notes in the Navigation Pane, so it's even easier). They're great for critiquing other people's manuscripts or just for making notes to yourself that you don't want to forget. In the screenshot, I've used it to record comments people made when Natalie workshopped my prologue. I also use it when I'm revising my own stuff and get stuck on something. Rather than sit there for an hour trying to think of a better phrase than "She ran", I'll add a note that I don't like it and come back to it later. A quick note on Open Office. It's open-source software designed to do everything MS Office can do, but for free. That's a major plus, and if you're low on cash or want to go legal, you should check it out. 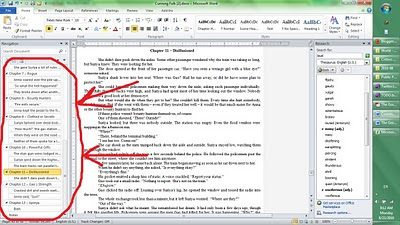 Open Office lost outline levels when opening or saving from Word Doc format. Bulleted lists and outlines didn't play nice when swapped between OO and Word. For the life of me, I could not get OO to save my manuscript in RTF without totally screwing up the formatting. (This one made me particularly mad as an agent asked for my full in RTF format). This has nothing to do with novels, but MS Office has a nice feature that allows you to compress all pictures in a document or PowerPoint slideshow (meaning it reduces the size and resolution to what is actually displayed), thus significantly reducing the size of your document. Open Office doesn't do this, and as far as I can tell has no plans to. Numerous minor, mostly-cosmetic annoyances (many to do with Notes and Track Changes) that I would normally put up with if they were the only problems. Now back to our regularly scheduled post. Last one, then I'm out. You know how to use Track Changes, right? No? Man, it's the best way to do line edits. Turn the feature on (it's in Tools or Review or something) and then make any changes you want to your buddy's manuscript. Your changes will show up in a different color, making them easy to spot. Deletions will either be struckout or put in a Note on the side, so all the original text is still there. And of course you can add your own Notes to explain why you're making the change. When your friend goes through the changes, they can cycle through each change individually, accepting or rejecting each one (so you don't have to manually make the changes if you don't want to). Optionally you can choose to accept or reject all changes at once. So that's how I use Word. What program do you use for writing? If you use Word too, are there any features I neglected to mention that you find useful? (Maybe I don't know about them!). Tracking rocks. I can assure you that the free Word Tracking tutorial at http://www.michaeledits.com is excellent because I didn't write it. I found it. Thanks, Michael. That's way better than my "it's in Tools or Review or something." Thanks for showing people how to really use a program that most people don't realize has so much to it! Thanks so much for sharing these tips. I had no idea I can do all this stuff on my MS Word! I love notes. I use MS on one computer and OO on the other. Though I'm tempted to replace OO with Scrivener. Yay, I'm so glad you guys are finding this helpful. I always worry when I write a really long (and slightly technical) post. Myrna, have you had any problems with OO (like the ones I mentioned maybe)? I sometimes wonder if it was just me. It's not just you, Adam. I lose things like page numbers, and it messes up my spacing. But Windows tends to cause more problems for me than OO. Dude! You are way more organized than I am with that outlining part. Very cool. Also: my small publisher rocked the track changes. Considering there were 3 different editors along the way it got a bit multi-colored along the way, but it worked. And I should have known there was a keyboard short cut for inserting comments! Awesome. I still can't believe I didn't know about Document Map, but that's what friends are for, I suppose. On thing that annoys me about track changes is if you have to delete or edit something tiny (like changing a comma to a period), it can easily be missed, because it doesn't show up on the sidebar. Not a huge deal, though. Boys Read! Stop Saying They Don't!